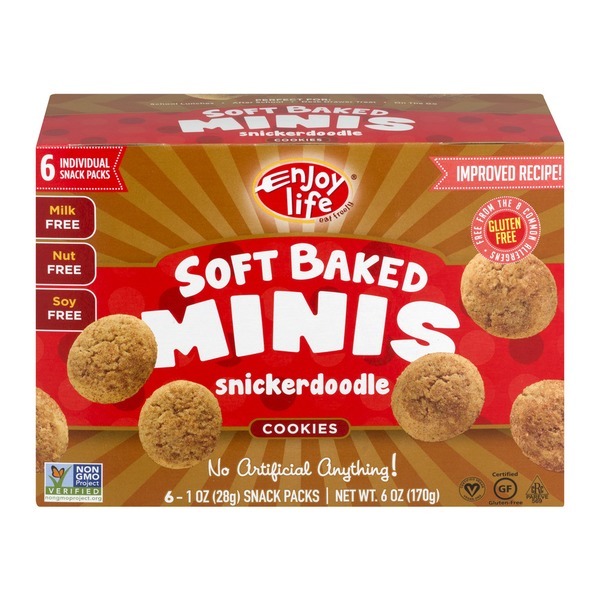 Enjoy Life® Soft Baked Minis Snickerdoodle Cookies. Eat freely. Improved recipe! Free from the 8 common allergens. No artificial anything! Milk free. Nut free. Soy free. Certified Gluten Free. Certified Vegan. 6 - 1 oz (28 g) Snack packs. Net Wt. 6 oz (170 g). Flour Blend (Brown Rice, Sorghum, Buckwheat), Water, Date Paste, Cane Sugar, Expeller Pressed Safflower Oil, Vegetable Glycerin, Brown Sugar, Palm Shortening, Natural Flavor, Cinnamon, Vanilla Extract, Salt, Xanthan Gum, Leavening (Baking Soda, Cream Of Tartar), Konjac, Rosemary Extract.